Gallery Page 1- Elizabeth Campbell (Golden Rubi) in a low-cut dress! Wow! Gallery Page 2- Elizabeth Campbell (Golden Rubi) in various outfits. Gallery Page 3- Elizabeth Campbell (Golden Rubi) HOT wrestling action! Gallery Page 4- Elizabeth Campbell (Golden Rubi) tied to a chair and escaping. Gallery Page 5- Lorena Valezquez (Loreta Venus) wrestling Sonia and losing! Gallery Page 6- Various promotional items for this movie. Movie #3- "She-Wolves of the Ring" (1964): An English-language version of the film is not yet available. 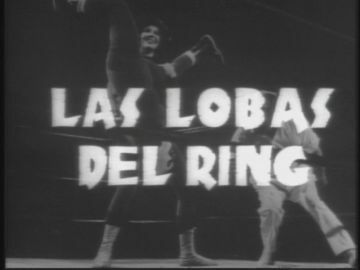 In Mexico, this movie is titled, "Las lobas del ring". It is a shame that this movie was not released in English for America. It continues the adventures of Loreta Venus and Golden Rubi in a non-monster, action-packed story. The possibilities for the Wrestling Women films were endless. In this entry, the Wrestling Women run afoul of gangsters. There's a lot of wrestling action, but there's only one real problem; the characters of Loreta and Rubi took a back seat to the wide cast of characters in this film. There were too many men and women wrestlers to keep up with, as well as gangsters, and it took a long time for the story to get around to Loreta and Rubi. They were still the main characters, but barely. The two female leads, especially Elizabeth Campbell, have really come a long way in actual wrestling talent. Lorena's great, too. The obvious stunt doubles are not as present as they were in the first film. There was a much bigger focus on wrestling this time around. There is also a good amount of comedy with Rubi's new, short Mexican boyfriend, and the older woman wrestler who abuses her husband. It can truthfully be said that the Luchadoras movies broke away from the science-fiction/horror genre in this chapter, and that the series was leaning more toward the action/superheroine feel.